Besides being a freelance service provider, you can also make money at Freelancer.com through the Freelancer.com affiliate program. Just promote about Freelancer.com and earn 90% from all project commissions of registered users who have posted a project as an employer or have won one as a freelancer. You may also promote Freemarket.com and be paid a commission of 10% for all items sold by your referred user. Before we start talking about the ‘ins’ and ‘outs’ of how this works; below is a screenshot of my recent affiliate activity for Freelancer.com to let you know that the program works. I was also able to withdraw accumulated earnings for the past few months only recently too. 1. Signing up is easy. If you are already a Freelancer.com member, then it’s even easier for you to begin participating in the Freelancer.com affiliate program. But if you’re not yet a member, it’s so simple to become one. You can read more about this later on. 2. Membership is free. Unlike other affiliate networks which will collect fees for you to start promoting their products or services, the Freelancer.com affiliate program is totally free. There are no fees to be collected. You can become an affiliate at no extra cost. 3. Earning commissions is easy. There are 11 advertising methods you can utilize in order to start earning commissions for the Freelancer.com affiliate program. These options are easy to make use of. Read more about them through a more elaborate explanation later. There are also no minimum earnings you need to meet monthly. You’ve heard about a popular affiliate network deducting money from users who are unable to comply with a mandatory monthly minimum earnings amount. The Freelancer.com affiliate program doesn’t impose such rules and won’t steal anything away from you! 4. Get paid instantly. There is no waiting time. You are paid instantly the moment that a referred user gets to sell an item and wins or assigns a project. 5. Build a passive income. If you are a freelancer generating an income by offering your services, you can even supplement your profit and build a passive income. Just refer Freelancer.com or Freemarket.com through links, banners, and feeds and be paid for every successful referral. If you are already an existing registered member and are actively bidding to win projects, you can supplement your income by participating for the Freelancer.com affiliate program too. All you need to do is activate your advertising methods and start promoting the site through various places online including blogs, websites, and even social networks. If you are not yet a member, signing up can be completed in a few minutes and is absolutely free. If you would like to sign up now, click on this link – Freelancer.com sign up page. Click on sign up on the upper right hand corner of the page. If you already have a blog or site, then it will be easier to start posting about Freelancer.com’s affiliate program. If you don’t have a blog yet, you may start with free blogging portals such as Blogspot or WordPress. Choose the URL or the blog’s address, pick a free template, and start displaying advertising methods available. For this blog, I am using the FreelancerCash Advertising Units type. With this method, you can choose from the following options: configurable horizontal/vertical block (I have employed the vertical version), 468x60 Full Horizontal Banner, 728x90 Leaderboard Banner, and 234x60 Half Banner. You can display from 1 to 50 projects and have them displayed randomly or the latest on top. With text links, you can simply replace templates with your user ID and post the link with an invitation to join. You may also write posts for a blog or site and embed the links instead. You may also display Freelancer.com’s affiliate program banners through your site or blog with the following sizes: 300x250, 336x280, 728x90, and 468x60. The banners targets buyers and not service providers. You may also display banners of contests held on the site. The banner sizes are similar to the Freelancer.com Banners. Advertising units 5, 6, 7 will allow you to display three banner sizes similar to the first three sizes available under advertising units 3 and 4. Number 5 is focused on the Freemarket site while nos. 6 and 7 are centered on sellers and buyers respectively. Advertising units 8 till 11 are more technical in nature and requires knowledge on programming. You can learn more about these units once you sign up for the Freelancer.com Affiliate Program. 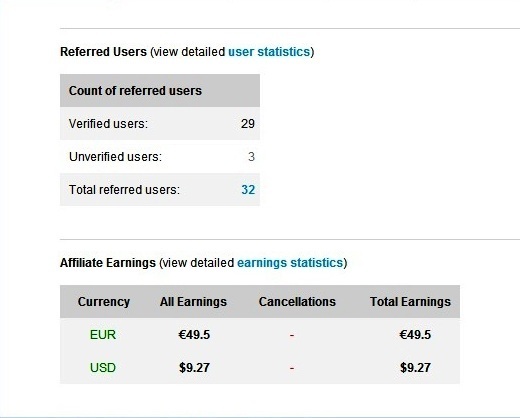 You can now start earning commissions from every verified user who signs up on the site through your referral link for up to 90 days. You receive a commission of 10% for every item sold at Freemarket.com and 90% of the fees for all projects at Freelancer.com. Withdrawing the funds uses the same system used by freelancer service providers on the site. I withdraw my first earning through PayPal (with $1 fee). Other methods include no fees for Freelancer.com debit card via Payoneer and Moneybookers, wire transfer (fees vary), and the fastest method which is the express withdrawal directly to your bank account ($2 fee) option. In case you receive commissions in different monetary units because freelancers and buyers can choose currency, you can actually have it converted to your preferred currency. I did that for mine since some of the commissions are paid in Euro. Earlier, we have mentioned about using any of the 11 advertising units. But how exactly will you utilize such units in order to maximize your earnings for the Freelancer.com Affiliate Program? Read on to know. The simplest advertising units to apply are text links. All you need to do is to insert your ID through a link template already provided and start posting the link through various places online. You can post the link through social network sites like Facebook and Twitter as if you are posting a wall post or a tweet. Make sure you include an inviting message when doing so and send the invitation only through your own wall or page. Never spam people’s walls as it may have your account reported for spamming. People, even your own friends, family, or relatives will still be turned off by spammy messages even if you are related to them. The link may also be included in general chat room wall messages. If you are a member of a chat group, you can send a GM or general message which incorporates your referral link preceded or followed by an enticing message. The same can also be applied for forums. If you are a member of several forums, just look for a related thread where you can share about Freelancer.com and its benefits to other forum members. You can even create an actual thread. But once again, the key here is an appealing invite which will not be labeled as spam and is not violating the forums terms and conditions. If you have a blog or site, you can also create related articles and embed your referral link within the post. A perfect example will be this article you are reading now. You may also incorporate banners as images within the post. Speaking of banners, these can be displayed on prominent locations of the site including the header, footer, and sidebars. Although the banners serve their purpose well, I find the FreelancerCash advertising units to be most effective. These units display active projects currently open on the Freelancer website. Thus, if potential users find a project which matches their skills, they will be encouraged to register for the site and bid for the project. This also increases the value of your referral. If you are an Adsense publisher, the format will be very familiar so you can actually replace non-effective advertising platforms on your site with a working one such as the Freelancer.com Affiliate Program. You can even configure your advertising block to display your preferred number of ads and choose between randomly showing the projects or with the latest projects on top. When you’re done, simply cut the completed code and paste it as an html code on a desired location within your site or blog. These can be the header, footer, or side bars. If you choose the horizontal or vertical block, the unit can even automatically adjust on its own and fill out the available space where you will have the code placed. This is possible if you don’t enter any value under the width or length size field. But if you are familiar with spaces available in your own site or blog, you can enter the correct measurements and the advertising unit will fit the allotted space perfectly for you. With these ideas, you can be able to maximize your earnings through the Freelancer.com Affiliate Program. These are various methods available for you to use that are easy to follow and simple to apply in order for you to promote Freelancer.com or Freemarket.com. So if you are not yet referring everyone, you can start doing so when you sign up for the Freelancer.com Affiliate Program. My account in Freelancer's website is no longer active (deleted actually). I haven't really opened it for some time now so all the notes on this post may no longer be valid. I suggest applying for an EON card (from Unionbank) or the E-Wallet from RCBC. Both are debit cards and can be used to verify PayPal via credit card. BDO also works for this purpose.